Few things in life are more fulfilling than taking care of a furry little friend. And with miscreants on every street corner, you know how badly our poor urban animals are treated. Stress reduction, unlimited love and plenty of cuddles — nothing sounds better! So if you’re looking to add a new member to the family, check out this list of shelters you can turn to, to help you find your new best friend. Team LBB is all about #AdoptDontShop! Charlie’s Animal Rescue Centre (CARE) started in 2013 as a place where stray and abandoned animals could be housed, given timely medical aid and rehabilitated — this quickly grew to an adoption centre. Charlie, the three-legged in-house therapy-dog, is a testament to their rehabilitation. The three trustees have taken up a half acre in Jakkur for the purpose of a fully functional animal rescue centre, with another three centres on the way. With 9-to-5 ambulance service, medical equipment like OPD and X-ray, holiday boarding facility and adoption, Charlie’s Animal Rescue Centre is a good bet if you are looking to bring home a four legged friend for life. Bangalore Cat Squad was initially a WhatsApp group founded by a small group of dedicated volunteers almost two years ago, that then developed into a full-blown network of fosters. Every month they host two events: an adoption drive, and a cat spaying/neutering drive (good vets and heavy discounts, so please get Sir Tibby fixed). The location changes each time, so keep an eye out on their Facebook page to stay on top of it. Operating out of a shelter on Kanakapura road, the shelter provides a safe space for abandoned street dogs, and a limited number of cats. The animals are lovingly nursed back to health by volunteers and fosters, before finding their forever home. They’ve started a new mobile adoption initiative, ‘Wheels For Paws’, to cater to accident and injured cases in South Bangalore! Pretty cool. The NGO Let’s Live Together is all about humans and animals living together in harmony for a better world. Achala Paani’s brainchild project ‘Life on the Streets’ promotes the concept of adopting strays, rather than shopping for animals, and ultimately challenges “breed discrimination”. They also work to connect independent rescuers with potential adopters to find homes for all their lovely kitties and puppies! In its new and revamped form, they currently have over 500 abandoned strays and mistreated dogs up for adoption. With the aim to provide the highest standard of service and latest technology, VoSD was started by Rakesh Shukla, who is immensely popular in the field and nicknamed “Dog Father”. Despite receiving both online and real-life harassment, a problem not unheard of in the field of animal rescue, he still single-handedly pushed through and has saved over 2,000 strays in the last three years. Compassion Unlimited Plus Animals (CUPA) is exclusively a dog rescue and adoption centre. A staple on the Bangalore adoption scene, CUPA connects with adopters from all around India, and has perhaps one of the most comprehensive care facilities for strays in the city. They also work towards creating understanding and spreading information about the care and attention these animals need. DogSpot.in is a national dog portal. The passion for dogs is a common binding force, and thus, the founder decided to set up an open-sourced portal where anyone in the country could put up their pets for ethical adoption, or indeed, scout out for pets to adopt. It is an open platform for information sharing and is not involved in the sale or purchase of puppies and dogs. The users can interact with each other directly for adoption of pets, making it sufficiently decentralized and convenient for the adopters. Cat Studio at CARE is the place you need to go whether or not you’re looking to adopt, drop in for some feline affection and get some work done (yeah, right). They have a strict vetting policy, and are keen to make sure you and your new fuzzy friend are a perfect match, so you know you’re in the right hands here. Krupa is an NGO for boarding, rehabilitation and treatment of animals. Running on a shoestring budget, they manage exclusively through donations and sponsors. 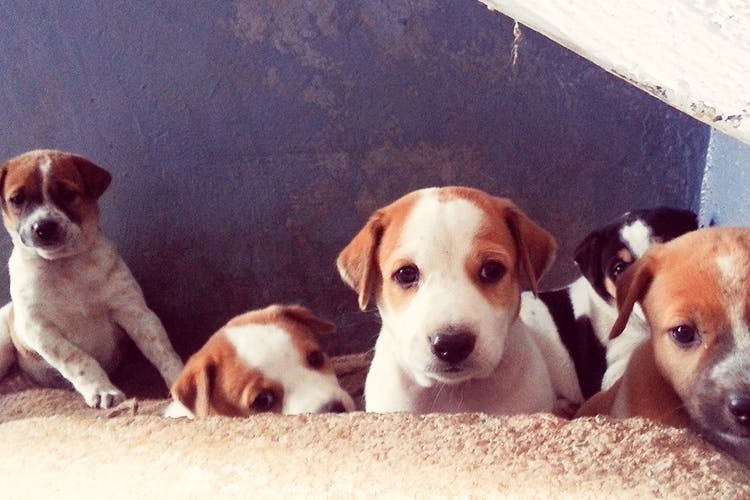 Krupa’s Mission is to help stray animals in distress, especially dogs in trauma. They’re currently not accepting abandoned pets due to space constraints, so if you are thinking about adopting a pet from here, you can be sure that it will definitely be living a better and happier life with you! With inputs from Akshaya Maller.